The Ministry of Health in Saudi Arabia has informed the World Health Organization (WHO) of another confirmed case of infection with the novel coronavirus (NCoV). The patient was hospitalized on 29 January 2013 and died on 10 February 2013. The case was laboratory-confirmed on 18 February 2013. 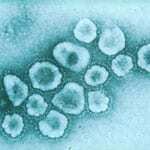 Coronavirus is the same family of viruses that caused the 2003 severe acute respiratory syndrome (SARS) epidemic that killed some 800 people, primarily in Asia. Initial reports of the novel strain surfaced last September. Read more at the World Health Organization Global Alert and Response website.